Better hop on it! 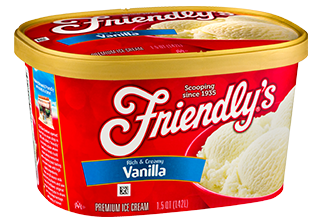 The Easter Bunny is right around the corner and it’s time to fill your basket with Friendly’s Vanilla ice cream! Melt butter in a large sauce pan over low heat. Add marshmallows and stir until melted and blended. Turn off heat and set aside. Coat muffin tin pan with non-stick cooking spray. Working quickly, take a large spoonful of the mixture and press into each muffin cup. Use your fingers to press against the edges and create the basket shape. Let cool. In a bowl, combine shredded coconut with 2 drops of green food coloring and stir well until blended. Place 1 scoop of Rich & Creamy Vanilla ice cream in each basket and press firmly down with the back of the scooper or spoon. Sprinkle the green shredded coconut on top of the ice cream, and then add a few chocolate candies or eggs. For each basket handle, cut red licorice and place into the ice cream, against the basket edges.